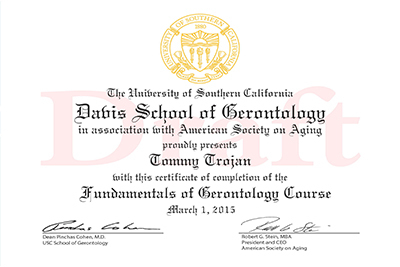 It’s not too late for CSAs to register for any of the four online courses offered by American Society on Aging (ASA) and USC Leonard Davis School of Gerontology. For each online course completed CSAs can earn a certificate of completion from USC and elect to receive 10 CEUs from the Society of Certified Senior Advisors. ASA and USC are especially excited to present two new five-week online courses, Elder Mistreatment: Understanding Abuse and Neglect - and - Elder Mistreatment: Prevention of Abuse and Neglect. Packed with relevant research and practical information, the courses explore all aspects of elder mistreatment with a focus on research-based communication, assessment, prevention and intervention models. They are especially applicable for direct service professionals of all levels, given the complex and intimate nature of your work with older adults. Additionally, the American Society on Aging is offering Managing Health and Chronic Conditions in Older Adults which identifies common health issues and examines strategies of care. Demography, chronic disease and self-care management, dementia and mental health issues, and medication management are all explored. All three courses, plus Fundamentals of Gerontology, will be offered August 28, 2017 to September 29, 2017, the last chance for 2017! You can take one course or all of them, depending on your individual professional development needs. They are flexible. Click here for more information, course video clips, and to register. Not an ASA member? Use Code "USC7" at registration to save $60 on the professional member rate. Or, choose the non-member rate for $630 which will include a Green ASA membership. The American Society on Aging (ASA) is excited to support the work of Certified Senior Advisors (CSAs) and invites you to take advantage of these professional educational opportunities in 2017.